While we'd all like to see Zimbabwe's Marxist dictator, Robert Mugabe, behind bars, some of his opposition is little better. Ever wondered why many of our vocal anti Apartheid activists, like John Minto, who indirectly helped bring Mugabe to power are now helping his opposition? Zimbabwe's main opposition, the Movement for Democratic Change is heavily influenced by leftists and unionists. Until 2002, it was also infiltrated by the Trotskyists of the Zimbabwe International Socialist Organisation. ZISO's, NZ sister party, Socialist Worker supports the Zimbabwean Trotskyists and Minto is very close to Socialist Worker. Now Socialist Worker is bringing a leading Zimbabwean opposition leader to NZ. His name is Munyaradzi Gwisai. He will be speaking at the Global Peace and Justice Auckland Forum in Auckland Trades Hall, Great North Road, on Monday April 23rd at 7.30pm. Growing up as a small boy during the anti-colonial war of liberation led by a guerilla movement that proclaimed itself Maoist – Stalinist Socialist, l like many in my generation were to be strongly influenced by the radicalism and proclaimed socialist ideology of this period and struggle. However, I got seriously involved in organized revolutionary socialist politics when l entered the University of Zimbabwe under the influence and mentorship of lecturers at the Faculty of Law who were mainly steeped in Maoist - Stalinist politics. In October 1989, the Students Union president, Arthur Mutambara (now president of one MDC faction) and myself as the secretary general, along with ten other members of the Students Reprsentative Council (SRC) were arrested and subsequently detained for three weeks for having planned to hold an anti-government rally at the university and issuing “subversive” literature. 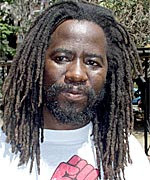 The university was closed for the first time after independence following massive student riots in protest against the arrests whilst Morgan Tsvangirai, then ZCTU secretary – general was also arrested when he issued a statement in support of the students. Subsequently l have been engaged in politics and struggle as a member of the International Socialist Organisation, whose Zimbabwe chapter was formed in 1989 but which l joined in 1991. As a member of the ISO, l joined the MDC at its formation in 1999 based on the entrist tactic. I was elected a Member of Parliament for Highfields (one of the radical townships in Harare and which used to be represented by Mugabe in the period before he became President). The ISO was expelled from the MDC in April 2002 following serious disagreement with the massive rightward shift of the party to fall under the control of local and international forces and its soft – soft cowardly approach of dealing with the Mugabe dictatorship. Contrary to the strategy of relying western sanctions, flawed elections or the courts, the ISO and myself had fought for a radical mass action based approach steeped on anti-neoliberal and anti-imperialist platforms. Matters came to a head in 2002 when the party leaders embarked on talks with ZanuPf brokered by South African president Mbeki and Nigerian president Obassanjo. Following our massive oppositiont o the same and our general support of the land seizure programme the ISO was expelled from the MDC in April 2002, and l subsequently in November 2002, leading to my expulsion from parliament. Whilst part of the struggles against the dictatorship of Muagbe we have therefore not been cheerleaders of the bourgeois opposition but have called for and supported the emergence of a broader and more progressive anti-neoliberal and anti-imperialist united front to the dictatorship. It is in that context that we have been quite active in the local and regional social forum processes as well as the strikes and demonstrations by labour and other social justice activists. quick off the mark there, Trev, only took you two days to get this one up!!! Can I suggest you keep an eye on the new Socialist Worker blog in future- www.unityaotearoa.blogspot.com ? Munya has been beaten, teargassed, imprisoned and lived under death threat from the Mugabe dictatorship. A comrade of his in the student movement was killed last month- the hunger is so intense amongst the urban poor that one of the movement's slogans is "we will eat your teargas". Don't you care about these victims of a Market Stalinist dictatorship, Trev? I certainly do care STF and I acknowledge your friend as a very brave man. What I want to see in Zimbabwe is what I want to see here. Limited constitutional government, the rule of law and free enterprise. Is Mr Gwisai likely to provide this, or we he merely replace one form of socialism with another? Good intentions and courageous action can still produce disaster if the underlying ideas are wrong. The minute Mr Gwisai gets on the right track, I'll back him wholeheartedly. PS I cottoned on to the SW Blog awhile ago. Will be posting on it soon. I think the term "nappy-headed ho" for the people who invited this pro-Mugabe Communist to speak should be applied here to be as such. Good on the groups who have brought Munyaradzi Gwisai to NZ. Good to actually hear from people on the ground fighting repressive regimes. Why don't they bring a farmer or businessman cameron-someone who's really trying to help? Well Trev, i can't really see Socialist Worker bringing over a land stealing settler, given their support for Tino RangaTiraTanga, or a profiteering business person, given that inflation in Zim is at 2000% and most people can't afford bread! Surely this would be the job of ACT's international officer? To be fair to SW, their job is to promote a trade union and socialist analysis of the crisis, and it is one that will certainly be new and interesting (Marxists opposing Mugabe?!! ).